This dish is my own recipe that I make special for my husband and it is so easy,light,and digestable that you just want more.its yum yum yummy! boneless or whole chicken (what ever you prefer) i like boneless. 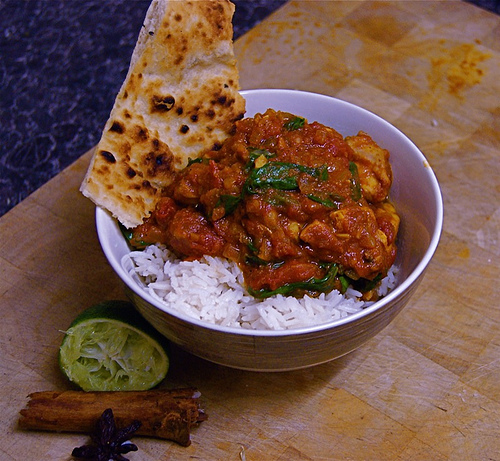 2 tsp MDH (curry chicken masala) you can get that from any indian grocery store. First heat oil in a pan then add coriander, cumin, with chopped onion, cook for 2 min then make the ginger and garlic paste and add in the onion. Cook until the oil separates and you see it being done, then add all the spices, mix them well, and add tomato and green chillies. Cook for 5-10 min add one cup of water so the masala doesn't stick also add fresh lemon juice, cook until the oil separates, then add your chicken pieces with 2 cup of water and let it simmer. You can add the water base on how much gravy you like, then cook for 10 min until you see the chicken is done and the gravy is not too watery. Then last put fresh clintro and enjoy guys ! Dear Kamini, Please post a real punjabi Chicken receipe.................................. waiting for the real flavor of punjab to taste!!!!!!!!!!!!!!!!!!!! For bhaktipradipbanerjee: I dont quite agree with you because every chicken is made with different fillings or desire and the one i posted, it is easy to prepare and a taste of everyone.chicken is made in varies of ways with different ingredients but the one i provides deals with the things that is avaiable for anyone,but anyhow,, that is how you feel thats your opinion! For Harsh: only a punjabi would understand whats punjabi about it? if you dont agree still, look at the ingredients CAREFULLY! For shweta shetty: Hi ! how are you ,well in everyrecipe in mine I leave it to my readers how much they want to use but since you ask I mostly use chicken drumsticks like 8 pieces ,and boneless a pound would be enough ,any other question please feel free to add all questions and comments respected! Dear kamani, your 'punjab da chicken' is the same way any normal chicken curry is made. on going through your recipie, i thought i would get some thing typically punjabi style dish. any way keep it up. What is punjabi about this recipe?? Just going through the recipe I can make out this will be a disaster. Dear Kamani, I haven't tried your recipe as yet, but when I went through the ingredients, it did sound really great. Meanwhile, it would be so nice of you, if you also could specify the quantity [ by weight] of chicken required in this dish. Hoping to see more of your culinary expertise on this site. Thanks, once again. Shweta.